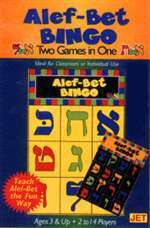 Teach Alef-Bet the fun way! Ideal for classroom or individual use. 2 to 14 players. Tailor the game to the age of the child by using either 16 letters per card for older children or 9 letters per side for younger children.